Red Riding Hood. This is the second awesome doll that comes wit her own DVD! 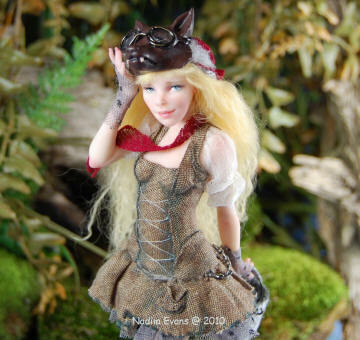 I self video recorded most of the "red riding hood" doll making process: the sculpting, the costuming, the wigging, and put it together on a exclusive DVD. Mother told me that you were feeling sick and in bed. So I started on the long path, deep in the woods, to bring you some things to make you feel better. But, on my journey to your cabin, I discovered that the world is mean and cruel. So I am sending you this letter to let you know that I will be arriving late since I have decided to take matters into my own hands. I think that's very clever and customers love having photos of their doll in progress so they know it's really hand made. Una gran idea, el que venga con el DVD,con toda la informacion. Has hecho un trabajo genial, es preciosa.